Dry hands and skin are a constant battle for so many of us during the dry and cold winter months. 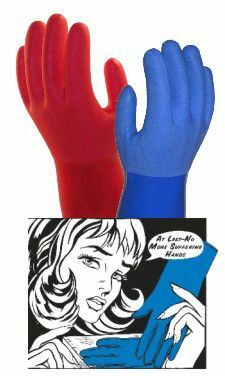 Protect your hands and give them a break when cleaning the dishes with the ultimate household gloves, True Blues! These gloves are soft and protective, even in hot water, and make for the perfect glove to use when washing the dishes or cleaning around the house. When we wash and dry our hands, we are drying out our hands, and you can prevent that with these True Blue gloves. More commonly, our customers love to use this gloves when cleaning around the house during tasks such as scrubbing the shower, cleaning the stove top, or washing the floors! During these tasks we are unnecessarily exposing ourselves to cleaners that damage and dry our skin, but with True Blues we can protect ourselves from these elements. What makes this glove so perfect for household use?